We are early birds. Usually the boys are up around 6am and unfortunately most events and attractions don’t open until 10am. I try to use the time in between when they wake up and when our activity for the day begins to try a new park or playground. Something that won’t take hours of our time, but will keep them entertained so they aren’t destroying the house all morning. Before our trip to Milburn Orchards, we stopped at Meadow Park in Elkton, MD because it fit the bill! This is one of those times where I use my trusty Google map site to locate a green blob to go to. We arrived to the park at the same time as all the football families were unloading for practice from their minivans. If you go on a Saturday morning, you can probably expect the same. Lots of shouting and cheering in the center of the park, with the playgrounds mostly on the outer rim. Meadow Park is sort of shaped like a racetrack, with an open grassy field in the middle. The boys loved the “rock” climbing walls at the playgrounds with two sizes to choose from. O loved that he could copy his big brother and climb the smaller wall and D was very proud that he could easily climb up and over it. It was a good confidence builder for them. 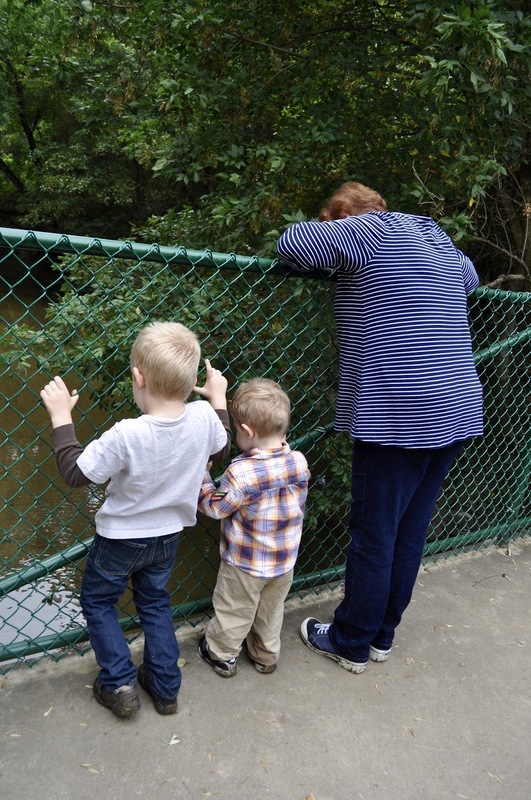 I couldn’t help but notice the creek that runs alongside the playground areas, it was calling to us! The boys had so much fun collecting items to drop in the water. We played the “sink or float?” game and D guessed which his item would do before it took the plunge. They both really enjoyed dropping the floating items on one side of the bridge, then going to the other side to see them go by. On the other side of the bridge was a trail that was begging to be followed, so we did. There wasn’t much on the other end, just baseball fields, but it was still fun to find out!